My university has done it again. On Friday the HR office sent out an email about a training program for folks who want a "panic button" placed on their office computers. I'm assuming this is for any kind of emergency that might occur on campus. The thing is, in the email--and in a follow up this morning, the day of the training--they merely included this advertisement and no other explanation or context. What would you think if you got an email with this image and nothing else? Junk mail? A message from some psycho following you around? God trying to tell you something? I'm not sure those who work in the faculty/staff training office have a sense of what is or isn't appropriate--or professional--when it comes to campus-wide communications. 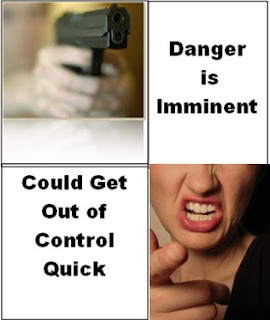 This reminds me of the active shooter training program flyer they sent out last year. What are these people thinking?! CREEPY! "Danger is imminent..." I would take this as a threat and call in some kind of armed bodyguard service, ASAP. Seriously, what kind of reaction are they hoping for?? Widespread panic, perchance?